The last week of the monsoon session of Parliament looked set for a washout as the Congress-led UPA government and the BJP continued on their collision course with both sides refusing to bend from their respective positions on the coal blocks allocation controversy. The Lok Sabha today passed a historic draft legislation which, for the first time in India's history, prohibits sexual harassment of women at workplace and prescribes penalties for employers who fail to offer the mandated protections. Domestic workers have been included in the law as working women. The law, however, is not gender neutral. Acceding to the demand from various sections of the Sikh community, film actor-producer Ajay Devgn today agreed to remove �objectionable scenes� from his upcoming film �Son of Sardar�. 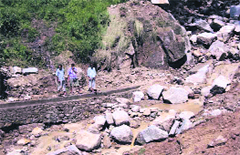 Seven Nepalese labourers were killed in a landslide that occurred during the construction of a road at Pambabe, Darma valley, in this district of Uttarakhand last evening. Voicing his protest against harassment of India Against Corruption (IAC) activists, Arvind Kejriwal Monday said they were ready to face punishment if the government felt that protesting against corruption was akin to breaking the law, and added that they would continue to do so in future. Infuriated over an argument, a 20-year-old today went on a shooting spree, killing four persons, including his sister-in-law and the girl he wanted to marry, in Bindapur area of North-West Delhi before killing himself in Ghaziabad. For the fifth time in three months, India has looked at Saudi Arabia for help to nab members its own home-grown terror modules and gathering more information on them. In the latest development, India now believes the recently nabbed activists of a South-India terror module, including a doctor, a journalist and a defence scientist, had hatched the entire conspiracy to target nuclear and defence installations in the southern parts of India at the behest of their �handler� based in Saudi Arabia.